Ross M Brown has a new solo exhibition at Lacey Contemporary Gallery called – Concrete Myths. 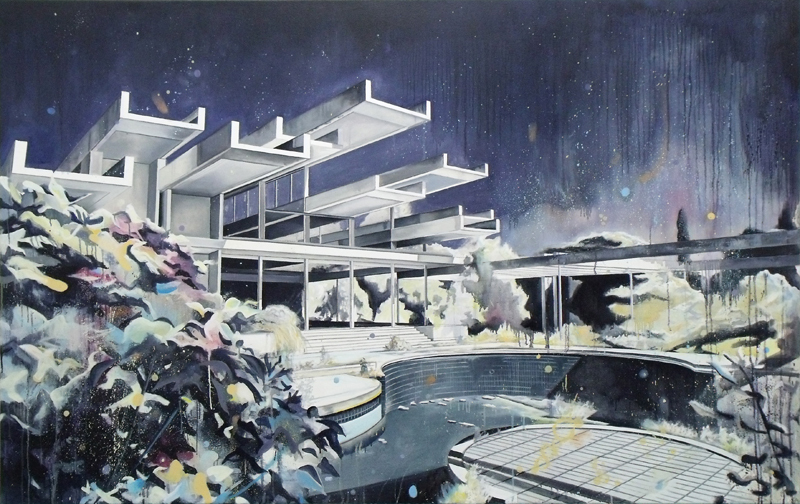 This new body of work was created following a research trip to the derelict Haludovo Palace Hotel on Kirk Island, a 1970s luxury resort designed by Modernist architect Boris Magas. Brown depicts the dilapidated location in a series of large scale paintings that often reference formal tropes more commonly associated with Modernist abstraction. Ross M Brown’s work channels the experience of architectural space through the medium and history of painting. Exploring subject matter found within abandoned Modernist architecture, the artist layers disparate approaches from the history of painting producing a palimpsest of diverging and converging painterly approaches. Relating to the urban ruin as a hybrid space where divisions between past and present, architecture and nature, order and disorder have become blurred and indistinct, Brown employs a painting process which pits rigidly constructed perspective against the fluid materiality of poured, smeared and dripped paint.